We are a leading Exporter of rubber diaphragms from New Delhi, India. 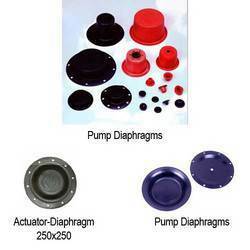 We are one of the pioneer manufacturers of Rubber Diaphragms. Our products are made from optimum grade rubber materials that are procured from established vendors and are also available in rubber-coated fabric option. Customers can avail these products as per their diverse requirements at industry leading prices. Looking for Rubber Diaphragms ?